What Is The Osaki 4D Pro JP Premium? 7 Key Features You Should Know About! An Important Note About Japanese Chairs! Here’s What I Think About It! Who Should Buy This Chair? #4 If Deep Tissue Intensity Is A Must! Best Place To Buy In The US? Best Place To Buy Outside The US? An Extraordinary Design Where All Components (Rollers, Airbags) Function Harmoniously Together! 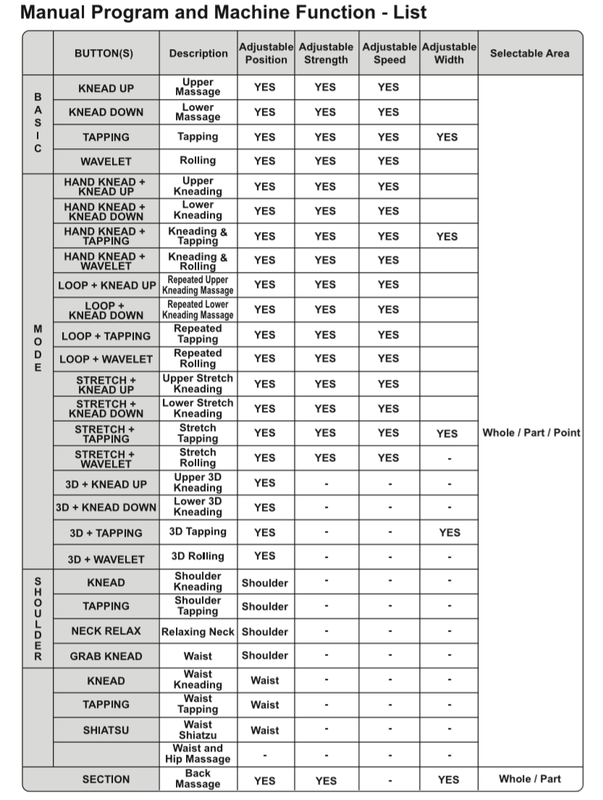 29 Different Massage Techniques Makes For An Incredibly Flexible Manual Mode! Considering It Costs Less Than A 3D Chair, Awesome Value For Money! 100% Designed, Engineered, & Manufactured In Japan! 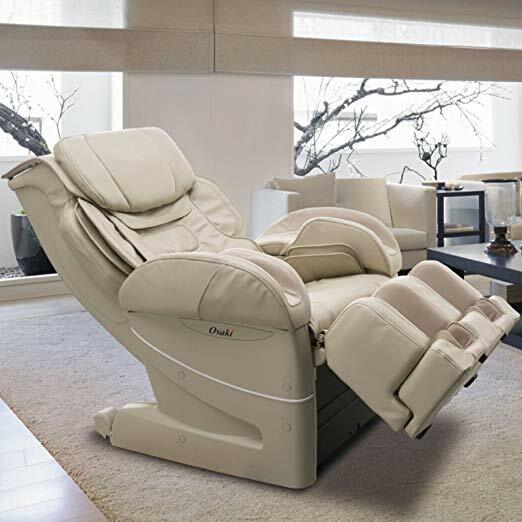 The 4D Pro JP Premium is a high end massage chair from Osaki that is fully designed, engineered, and manufactured in Japan. Who is it made by? Fuji Medical. The same guys who’ve been in the massage game since 1954. In fact a lot of early technology and innovation in the massage chair industry came from Fuji, believe it or not! In terms of intensity, 0 being mild, and 10 being crazy intense, this chair can do anything from a 6-10. As far as intensity range is concerned, this is the best I’ve ever seen in an Osaki chair. It does a great job massaging at low intensities, and does just as well at high, deep tissue levels. As mentioned earlier, the Osaki 4D Pro JP Premium is 100% made in Japan. 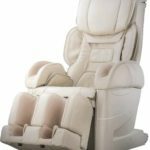 The company that makes this chair (Fujiiryoki) is an experienced manufacturer and really the “grandfather” of massage chairs. They started the whole shabang! Did you know that most massage chairs sold today are manufactured in China? Yes it surprised me too. In fact, majority of Osaki’s lineup is made in China. You may be wondering “what’s the fuss about? does it make a difference where a chair is designed and made?” And the answer is yes it does! Massage chairs made in Japan are far superior to chairs made in China. Japanese chairs are better designed in terms of function, and use high quality parts that last forever. If you’ve ever used a Japanese chair, you’ll kinda get what I mean. The entire system of airbags and rollers work perfectly in unison, and it feels like everything is awesomely synchronized! Chinese chairs are more likely to malfunction or become defective over the years. It’s a similar analogy to cars. We all know how reliable Japanese cars like Toyota and Honda are! We talked about 3D rollers the other day, and now we’re already up to 4D! 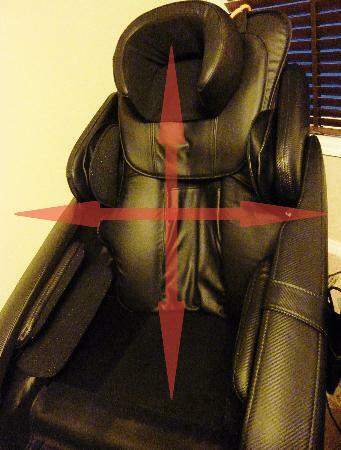 This chair features what Osaki calls Kiwami Mecha 4D ball system. Quite the mouthful! State Of The Art 4D Rollers! To really understand 4D rollers, you first need to understand 3D and 2D rollers. Let’s look at each in more detail. This is the kind of roller system that’s common in most massage chairs sold today. A 2D roller system is one in which the rollers move in 2 dimensions: up/down, and left/right. The image above explains this concept. Only a select few chairs have 3D rollers. The technology is still relatively new, so manufacturers are yet to fully integrate. In 3D chairs, rollers move in 3 dimensions instead of 2: up/down, left/right, and in/out. Even fewer chairs have 4D rollers. You can expect to pay a premium for one of them. 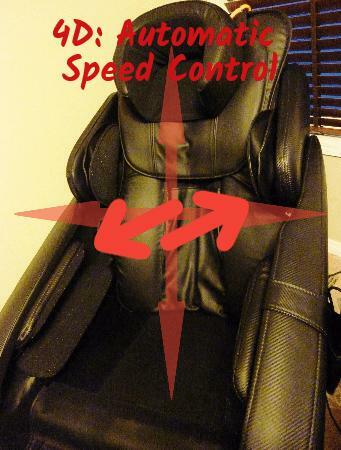 4D chairs are essentially 3D chairs but with 1 additional element of control: speed i.e. roller speed is controlled and accounted for in each technique. The 4D rollers in this chair can protrude/extend about 4 inches out. It’s pretty insane considering most chairs can only extend out to about 3 inches! Wait, I don’t get it….can’t 3D rollers do the same thing? Yes and no. You can definitely adjust speed on a 3D roller chair. The difference with 4D is that the rollers are more “intelligent” so to speak. They’re programmed to massage at various speeds without you having to manually make the change. 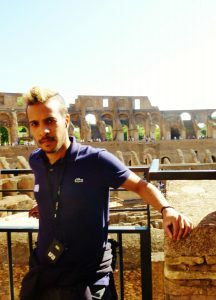 The objective is to try and replicate the movements of a massage therapist. 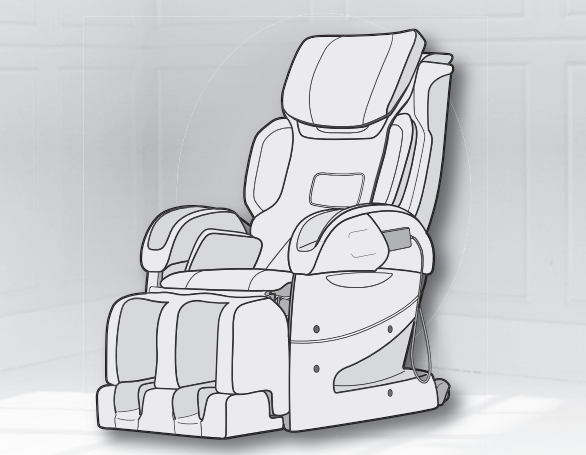 The sole purpose of a massage chair is to provide an automated solution to best replicate the real thing! And if you think about it, that’s exactly what technologies like 3D & 4D are striving to do. Is there a marketing side to it? Absolutely 100% there is, but it’s also game changing technology at the same time! The Osaki 4D Pro JP Premium has a total of 44 airbags all placed in areas where the 4D rollers cannot reach. These include the feet, shoulders, hips, glutes, calves, and arms. Airbags can be adjusted to 3 different intensities, and what’s nice about this is you have the ability to alter intensity for 3 different regions: upper body, lower body, and footrest. For example, if I want to get the airbags to really work my shoulders, I can leave that as a high intensity setting without affecting the lower body and foot rest intensity. For those of you who don’t know, airbags are just pouches that inflate with compressed air. When inflated, airbags provide an air compression massage to adjacent muscle and tissue. Airbags also have a secondary function, and that is to maneuver and stretch muscles. Inflated airbags push out or hold onto specific muscles thereby inducing a stretch position. The Osaki 4D Pro JP Premium has a heating element on each foot pad. 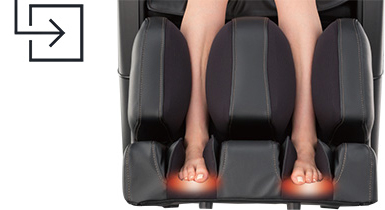 These provide a source of heat to the soles as they undergo an air compression massage. One thing this chair doesn’t have are foot rollers. Foot rollers are simply rotating bars that provide a kneading massage to the soles. Instead this chair uses air compression over the entire foot. If you’ve read my other massage chair reviews, you’ll know I’m a stickler for foot rollers. I think they make a massive difference as far as foot massage is concerned. It’s not enough to have air compression on the feet, there needs to be a good balance of different techniques, and a foot roller definitely helps with this. I love auto programs. They’re quick, easy, and require no prior setup. Just push a button, sit back and relax! This chair has a total of 10 auto programs. 5 of these programs belong to the “basic” category, and the other 5 are grouped in the “Kiwami Mecha” category. What’s the difference between both categories? The 5 basic programs are all low intensity. The 5 Kiwami Mecha modes employ the 4D rollers, so massage intensity is greater. As you can see from the list above, there really are 5 modes with each one having a slight variation or twist to it. If you’re looking for deep tissue intensity, you’ll definitely wanna try the Kiwami modes! This is what really distinguishes the Osaki 4D Pro JP Premium from other chairs. Non 4D chairs can only do about 6 different massage techniques. In fact, 6 is the max I’ve seen (4 or 5 is more common). What are these 29 different massage techniques? Basic—Consist of basic kneading, tapping, and rolling strokes. Mode—A combination of basic strokes. Shoulder—Various techniques focused on the shoulder area. Waist—Various techniques focused on the waist area. Section—Back massage on whole or part of the back. It’s a little confusing to understand at first, but it should all make sense when you look at the table below. One of the descriptions for waist is missing just so you know. But there are 29 techniques. I counted them all! Full List Of All 29 Manual Massage Techniques! If you want to know more about manual mode and how it works, then your best bet is to refer to the user manual. You can check that out by clicking here! This chair can be positioned anywhere from 120-170 degrees. This can be done right from the remote control. Does this mean it can recline to zero gravity? No, zero gravity is more than just a recline angle. Zero gravity is when your legs are elevated above your heart, and your torso to leg forms an angle of about 128 degrees. Important not to confuse recline ability with zero gravity. Both are 2 very different positions! Important to understand these distinctions as you decide what to get. Functions Harmoniously As A Unit! 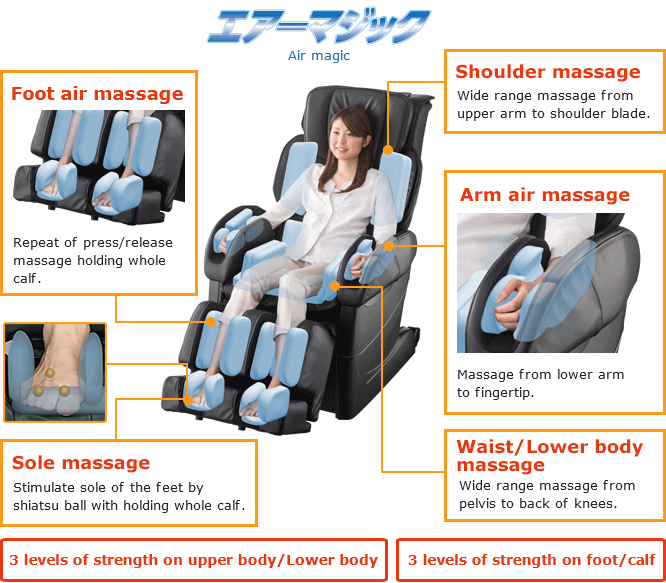 A well designed massage chair is one in which everything runs smoothly as a single unit. It’s when rollers and airbags work in harmony with each other. The bad news is that very few chairs are designed this way. The good news is that this chair is! 5 Year Warranty Included For Free! If you buy from massage chairs deals, you get a 5 year warranty. Japanese chairs are just so much more superior than their Chinese counterparts. Components function better and last longer, and so manufacturers are able to warranty for longer durations. A Beast In Manual Mode! I love the flexibility this chair offers in manual mode. 29 massage techniques is just ridiculous! Couple that with the ability to choose from 12 different strength levels (soft to deep), and you have one incredibly versatile massage chair! The class of this chair is evident when you run it in manual mode! 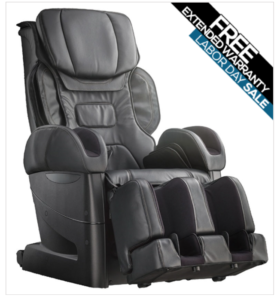 Pretty sweet deal considering it currently retails for only $4K at massage chair deals. You’d be hard pressed to find a chair with 4D rollers for this much! 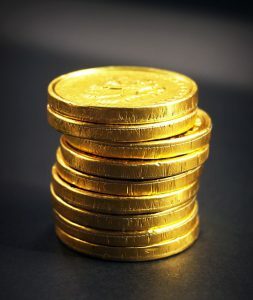 Of course pricing is subject to change in the future, but as it stands, incredible bang for your buck! In case you weren’t aware, the roller track span for this chair is 27”. I would have liked to at least see 31”, so I am a little disappointed. Oh well, you can’t have everything right! If Deep Tissue Intensity Is A Must! As mentioned earlier, this chair does not have zero gravity recline capabilities. Also, it doesn’t come with foot rollers. If you don’t care too much about these, then you should definitely consider this chair! My personal take is that both zero gravity and foot rollers are incredibly important, and I’m not sure if I could do without them! However, you and I are not the same. Everyone has their own preferences at the end of the day! MP3 speakers and LED lighting have no impact on my buying decision. To me it makes no difference if a chair came with these features or not. It bears no effect on massage function whatsoever! Osaki 4D Pro JP Premium doesn’t have speakers or LED lighting. Do you care? I don’t! 4D Pro JP Premium is not for large people. Important to remember that it was designed in Japan; a country where the average male height is 5’7 and the average female height is about 5’3. If you’re over 6 feet, I strongly recommend against getting this chair! However, if you have a small body frame and measure anywhere from 5’0-5’10, you should be fine. If deep tissue intensity is a must have for you, there’s nothing quite better than the 4D Pro JP Premium. 4D rollers trump 3D rollers as far as massage intensity is concerned, and this isn’t just true for deep intensity, 4D can also give a much better mild intensity massage compared to 3D. As good as the 4D rollers are on this chair, they unfortunately have a restrictive 27” track span. What does that mean? It means rollers can only target the neck and back. If you’re looking for rollers that extend all the way down to the glutes and hamstrings, you need to consider an L-Track chair. The below 3 are fantastic options in my opinion. 4D rollers with a 27” track span, or 2D rollers with a 53” track span? Plenty of options if you buy online, limited choices if you buy in store. Now’s the time to tell you that I will make a commission should you choose to buy from my affiliate link. My affiliate links placed throughout the post all redirect you to massage chair deals. 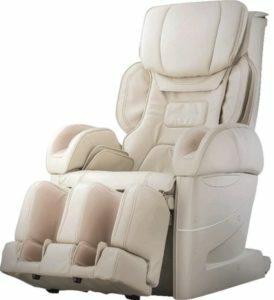 Why should you buy from massage chair deals? You Get An Extra 5% Off!—Enter in “MAM5” during checkout and score an extra 5% off. If you do the math, that’s $200 off a chair that costs $4K! Lowest Price Guarantee—They guarantee the lowest price, so if you find lower they will match and potentially beat! Interest Free Financing, Free Curbside Shipping, 24/7 Support! 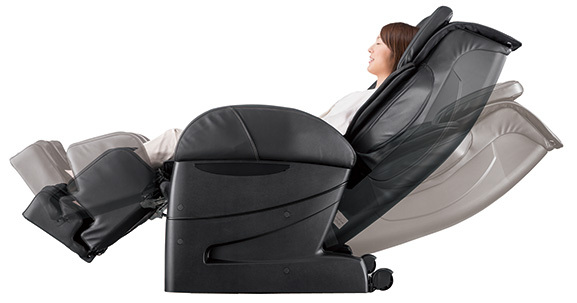 If you’re ready to head over to massage chair deals to check out what other people have to say about the 4D Pro JP Premium, feel free to use my affiliate link placed below. Always a little tricky if you live outside the US. Unfortunately massage chair deals do not ship to the US at this point in time, so your best bet is to either check locally in store or buy from Amazon. You may want to check out your local Costco. From what I recall, they always seem to have a couple massage chairs kicking around. If you want to check out latest pricing of this chair on Amazon, click the link below. It’s a lot of good, and very little bad! There’s a lot of great things about this chair, but the main highlight is the Japanese design and engineering. Everything from the 4D roller system to the airbags, down to the armrest is just so exquisitely put together. In my opinion, a full 10/10 as far as design and engineering is concerned! As mentioned previously, the biggest shortcoming is the limited 27” track span. 31” would’ve been perfect for this chair. Also, Fuji & Osaki should’ve spent a little more time on user flexibility, specifically ensuring this chair fits a variety of heights. If you do decide to go for the Osaki 4D Pro JP Premium, you will not regret your decision! I hope you found this review post useful. If you did, please consider sharing on the socials! 7 Tips To Massage While Flying! How Much Should You Tip A Massage Therapist? Is Massage Therapy The Cure To Your Vertigo?